After years of designing furniture in North Carolina, Jim Brown wanted to make pieces that couldn’t be bought in stores. Where better to do that than New England? His wife, Nance Brown, recalls the day that dream took root. Just off Coastal Route 1 in Lincolnville Beach, Maine, a five-acre historic farmstead was for sale. The owner, a “cranky Yankee,” warned: “Never open the barn doors, or everyone will pull off the road to talk with you!” That was just what the Browns wanted. Fast-forward twenty-five years. The Browns have sunny Windsor and Shaker showrooms, a barn-turned-workshop open every day this time of year, a staff of six craftsmen comfortable with giving frequent impromptu demos to passersby, and a ghost. More on the latter later. The name of their enterprise is Windsor Chairmakers. They embody made-by-hand, one by one tradition, earning the respect of lifelong Mainer neighbors. Using mostly local woods, pieces are made to order, right in the workshop, following traditional building and finishing methods. The buyer’s choices include wood – tiger maple (named for its pattern), black walnut, and wild black cherry. Also, table leg style (taper, spoon foot) and finishes. Options include chair height and inscriptions. 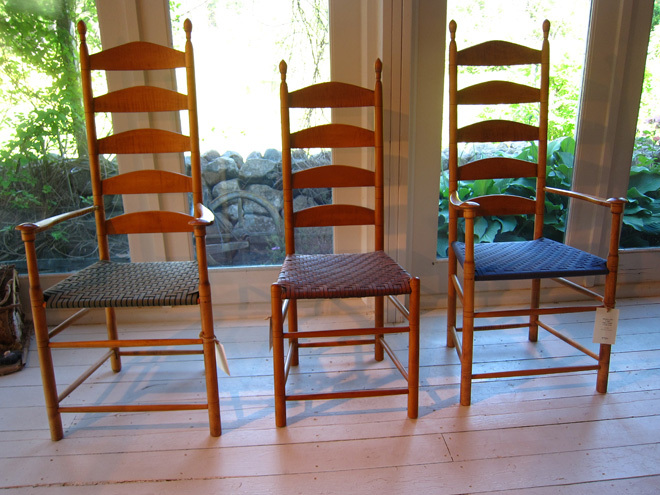 “My husband combines traditional New England design (note the one-piece seats) and updated flair,” says Nance, moving on to contrast sackbacks and hoopbacks in the gallery, formerly a pair of 19th century farmhouses. Jim’s design twists enhance visual interest and comfort; for example, graduated chair slates that support the back. A little flex is built in, with no compromise of durability. Rudder, a perky twelve-year-old Cocker Spaniel, trots the grounds. And, says Nance, a ghost hangs around the workshop. The Browns have branched into Shaker style and also into tables, beds, buffets, even cherry highboys. One table seats twenty without a leaf. Designed as heirlooms that transcend fashion, the pieces are priced accordingly. A Windsor armchair runs $996, a table seating four $1,788. Customers typically put down a $200 deposit; some want every step of the creation process documented so they in turn can explain the provenance of their furniture. The Browns offer a lifetime guarantee, but after a quarter-century only three people have used it. In the workshop, master chairmaker Mike Timchak explains tools and techniques such as steam-bending bows and carving out with bandsaws. “The scoop in the back of the seat and the flexibility of ash are secrets of a good sit,” adds Nance. 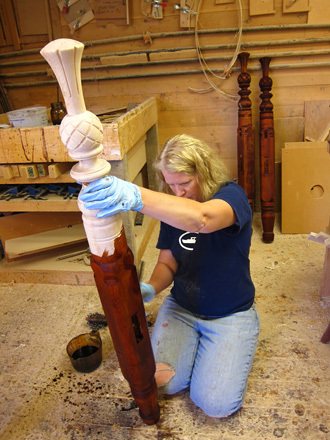 Furniture finisher Julie Cook brushes water-based cranberry stain on a tiger maple thistle post for a bed. “The grain of the wood will rise up and capture the color,” she explains. 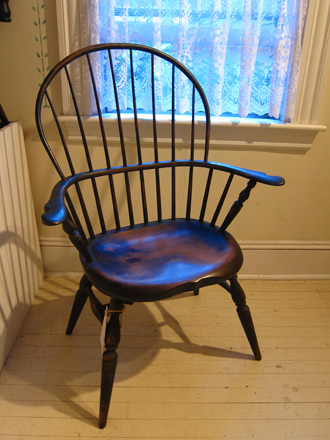 We mix our own dyes, apply three of coats shellac, and rub with beeswax for that nice soft finish, says Nance. 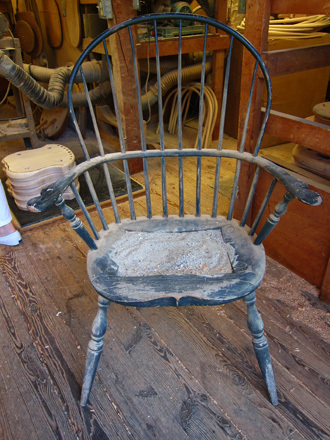 What about the old Windsor chair with a tray of sand in its seat? It’s used to obtain an impression of a customer’s bum for the ultimate in customized chairs, says Nance. I should have known she was kidding. In the area and well-worth visiting is the Center for Furniture Craftsmanship - a year-round, nonprofit woodworking school.